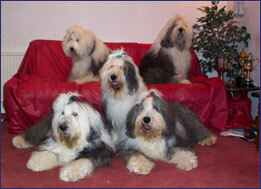 Lottie (centre) is Mother or Granny to the rest of the crew. At nearly 11 she is still enjoying life to the full and organising everyone. She has returned to the show ring and has won several Championship Best Veteran in Show awards and been placed in veteran twice at Crufts. Lottie with some of her first litter, shortly before the birth of her second.